X-GLOO is an innovative range of inflatable events tents designed and manufactured with German engineering expertise. With a print area of 2.7m x 2m, the X-GLOO Inflatable Display Wall provides a large display area – ideal to use as a backdrop to maximise brand exposure. The PVC inflatable frame has durable welded seams and connection points and is built for a long life of repeated use. The wall graphic is dye-sublimation printed in full colour to a brilliant, high-quality finish. Graphics can be printed on PVC or mesh fabrics and, whichever you choose, the result will be a vibrant print. Depending on the type of pump you use there is a set up time of between 2-10 minutes – no wasting time on set up, giving you more time to focus on other aspects of your event. The X-GLOO Wall comes with a hand pump included. An electric pump is available separately to speed up assembly time. Despite its size the X-GLOO Display Wall is lightweight and packs down into the trolley case provided, making it portable and easy to store when not in use. The entire case will fit into the boot of a car. X-GLOO Inflatable Wall can be used indoors or out. The stainless steel hardware on the inflatable frame resists rusting. The print is colourfast and UV resistant so vibrant colours stay vibrant. The indoor kit comes with 2 aluminium stabilising feet which will support the wall on indoor surfaces. It also includes an anchoring lines and peg set. The outdoor kit includes the inflatable support plus anchoring lines and peg set as standard. The anchoring lines can be used in a similar way to guy ropes on a tent to secure the wall in place – ideal if using outdoors. Other anchoring options are available, such as water ballast barrels which help weigh down the wall so it can be used on almost any surface and in all weathers. 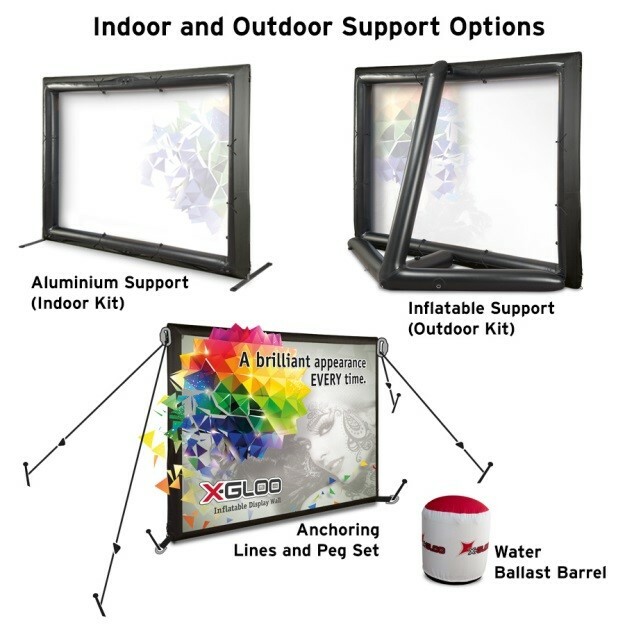 The anchoring options available ensure that the X-GLOO Display Wall will stay put in locations with high winds. To help with wind stability, choose a mesh material wall print which offers improved air pass-through. Multiple X-GLOO Display Walls can be linked together to create an even larger display space. 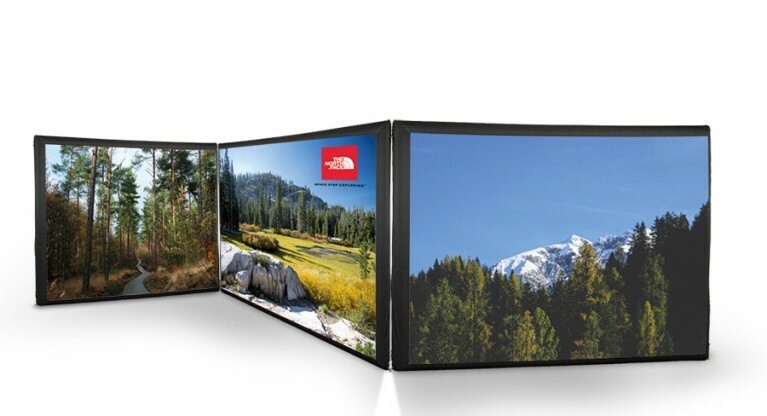 We offer both indoor and outdoor linked kits which include three display walls. Each wall can be used individually or can be linked together to create 9m of display space – ideal for large scale events where size matters. The walls can be used in a straight line or in zig zag or u-shaped formations depending on your needs. The wall print can be removed and replaced within minutes using the simple, but clever, toggle system. This makes the X-GLOO Display Wall an ideal solution if your marketing messages change frequently. Simply buy a replacement graphic and change it yourself. All wall prints can be kept and stored so are still available to be used again if needed. You can provide your own artwork for the X-GLOO Inflatable Display Wall. However, if you do not have artwork we offer a graphic design service and one of our designers can work with you to produce your X-GLOO display. 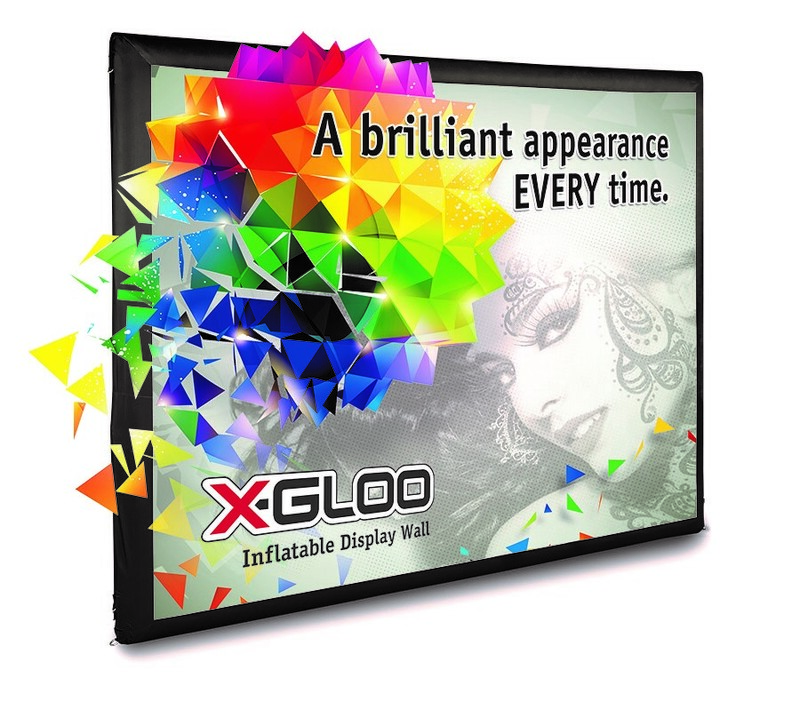 At XL Displays we are an official X-GLOO distributor and service partner for X-Gloo worldwide. We pride ourselves on high quality display and exhibition equipment as well as customer service that is second to none. For more information on the X-GLOO Display Wall or X-GLOO Inflatable Tents please contact us or call us on 01733 511030.